NEW YORK, November 6, 2012– At a time when growth is slow—if not stagnant—and risk is elevated in developed markets, companies from both developed and developing markets are increasingly looking to expand their presence within emerging markets. 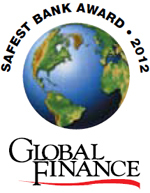 It is within this context that Global Finance announces its second annual ranking of the 50 Safest Banks in Emerging Markets. For the ranking, Global Finance used the same criteria as is applied to the Annual World’s Safest Banks ranking, which appeared in the October issue—a recognized and trusted standard of creditworthiness for the financial world, now in its 21st year. The rankings clearly show the ever-growing dominance of China’s banks both within Asia and throughout the emerging markets. Chilean and South Korean banks also feature prominently in the rankings, as do those of Kuwait, Saudi Arabia and the UAE.